This special formulation delivers the key support nutrients, Vitamin C (a powerful antioxidant), Zinc and Copper, to support healthy skin. It also contains Collagen - a source of key amino acids, MSM and other ingredients. 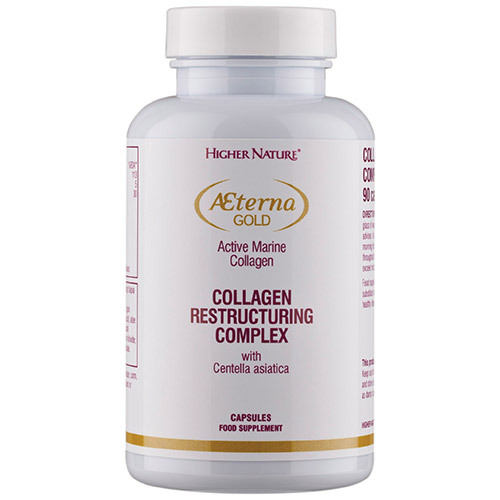 Aeterna Gold Collagen Restructuring Complex is best used in addition to Collagen Creme Serum. Hydrolysed collagen (from fish [tilapia catfish and pangasus catfish]), capsule: hypromellose (carrageenan); Centella asiatica (gotu kola), methyl sulphonyl methane, ascorbic acid, aloe vera 200:1, chlorophyllin, natural horsetail, magnesium stearate*, anti-caking agent: silicon dioxide; anti-caking agent: stearic acid*; zinc citrate, ferrous sulphate, copper gluconate. Take 3 capsules before bed with a glass of water, or as your health professional advises. As an optional extra also take 3 in the morning for the first month. Drink 1 - 2 litres of water throughout the day to optimise results. May not be suitable for people with a fish allergy. Below are reviews of Collagen Restructuring Complex - 90 Capsules by bodykind customers. If you have tried this product we'd love to hear what you think so please leave a review. Excellent! I am buying this product second time and now I can really see the changes! After the first bottle my hair started growing faster and now my nails as well! My skin improved, less wrinkle. Definitely thumbs up and recommend it to everyone. Great product! 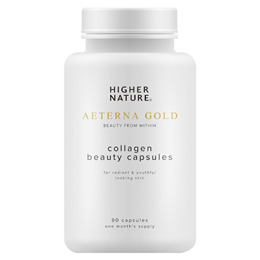 I already used Higher Nature other collagen capsules and I was very happy with the result. My hair and skin feels, looks better. I thought I give a try for this one. It does the same good. Excellent service ... product came the very next day after ordering. Good value too ... the best price around. This special formulation delivers the key support nutrients, Vitamin C, Zinc and Copper, for healthy skin. It also contains Collagen - a source of key amino acids, MSM and other ingredients.